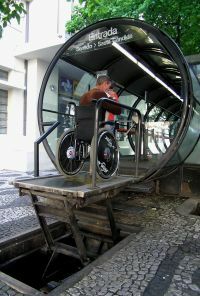 Coaches are the most widely used form of long distance travel in Brazil. The vehicles are comfortable, the services very reliable, and relatively inexpensive. Many trips are operated overnight with sleeper coaches so the canny traveller can get from A to B without incurring the cost of a hotel room. There are dozens of different bus companies operating on the main routes and this competition ensures that standards are maintained and fares kept affordable. Just like airlines, there are different classes with different levels of comfort. Brand names may vary but from the lowest category up they are Convencional, Executivo, Leito and GTV or 1 Classe. Convencional means a 42- to 50-seat coach, air-conditioned, with toilet. Executivo means fewer seats – say 34-40 – but all recliners with foot rests. Passengers can expect TV and/or CD player, minibar and air conditioning. Often a snack is given out before boarding and for overnight trips there will be blankets and pillows available. Leito means sleeper and usually there are just two dozen individual sleeper seats with the option of blanket and pillow. The coaches are equipped with TV, refrigerator, CD player, air conditioning and toiletries. Passengers receive a special snack on boarding. GTV (Grand Turismo veicolo) or 1st classe have extended recliners, TV, CD player, minibar and air conditioning. 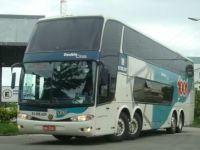 Only on the Rio de Janeiro and São Paulo route, some operators offer two options of service on the same vehicle: 24 seats of semi-sleeper standard on one deck and just nine leather sleeper-seats on the other. Upon boarding, passengers receive special snack or snacks, blanket and pillow. Solely from a travelling perspective, a base in Rio or Sao Paulo would be the optimum choice. The former is the more glamorous, chaotic and dangerous; the latter city is more staid but organised and safer. 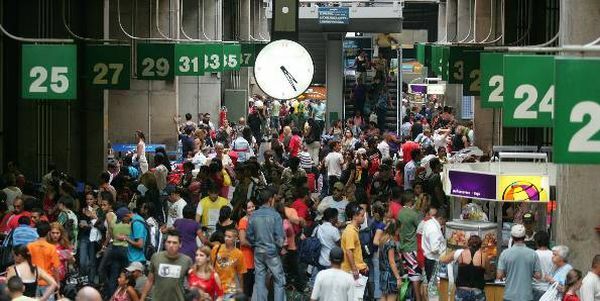 For those based in Rio, the bus terminal is Rodoviária Novo Rio in the Santo Cristo neighbourhood. It is not on the metro but taxis and Frescão air-conditioned coaches link the terminal to the city centre and main hotel areas of Copacabana and Ipanema. In São Paulo, the terminal is Rodoviário do Tietê, said to be the second largest terminal in the world and an enormous building. The terminal has its own station on the metro Blue line. There are two other long distance terminals in the city but neither is relevant for English football supporters. Starting with the group, air travel is the only practical way of getting to Manaus for England’s first game. São Paulo-based fans have it easy for the second game against Uruguay as it will be in that city. Those in Rio have a choice in getting to São Paulo: 76 bus departures every 24 hours operated by five different operators – possibly more during the World Cup. There are 53 daylight trips and 17 overnight leaving very late and arriving around 06:00 the next morning. There are also half a dozen departures in the evening that arrive at unearthly hours like 03:00. The journey takes about six hours and the fares range from 81 Real (about £22) to 149 Real (£41) depending on time and class. All are bookable on line. The third group game is against Costa Rica in Belo Horizonte in the Brazilian midlands. From Rio there are nine daylight and 11 overnight journeys with fares ranging from £21 to £38.75. The journey time is between 6hrs 30mins and 7hrs and there are two bus companies: Cometa and Viação UTIL . From São Paulo to Belo Horizonte there are seven daylight and 20 overnight journeys with two operators: Cometa and Gontijo. This route is a longer journey at 8hrs 10mins and fares are a bit more expensive ranging from about £27 to £48. If England wins its group, next stop would be Recife. That is a long way from both Rio (about 1,430 miles) and São Paulo (about 1,625 miles) so fans would have to fly. Things are a bit better, travel wise, should England be runners up in the group. In that case the match would be in Rio, handy for those based there or a 6-hour bus ride as described earlier for those in São Paulo. If England make the last 16 stage, either of the quarter finals they would be involved in difficult journeys. If they progressed from Rio, the next stop is Fortaleza, way up north, some 1,800 miles from São Paulo and not much less from Rio. Take a plane. If England win at Recife, the next match is at Salvador. Those based in Rio could get to this city on the coast by bus but the journey is a long one: at least 25 hours. There are three departures a day and the fares start at 268 Real (£72) and go to 292 Real (£78). Águia Branca offer semi-sleeper service but Itapemirim is only conventional. For those based in São Paulo, it means getting on a flight as the two cities are over 1,200 miles apart, or 32 hours by road. In the most unlikely event of England getting to the semis, their match would be in either São Paulo or Belo Horizonte, coach travel to which we described earlier. As for being finalists – ha, ha – that would mean England running out in Rio’s stadium. But one would suspect that they would already be on the former Silverjet Boeing 767 and on their way home.